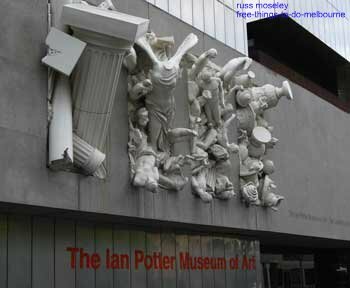 The Ian Potter Museum of Art is part of the University of Melbourne and is located on the University campus. 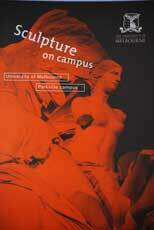 The University has been collecting art since it's beginning in 1853 and has one of the largest art collections in Victoria. It holds 16 exhibitions a year, largely comprising Australian art but also has some European archaeology collections, indigenous cultural material, decorative arts and 20th century posters. When I went along there were Greek and Roman coins on display and paintings, drawings and prints from the Ewing Collection which is mainly Australian art from the 19th and early 20th century. It's easy to find the museum as the (no longer quite free) shuttle bus stops right outside (stop 7). It's at Swanston Street, Parkville between Faraday and Elgin Streets. It's open Tues-Fri 10am-5pm, Sat/Sun 12.00-5pm, closed Mondays. 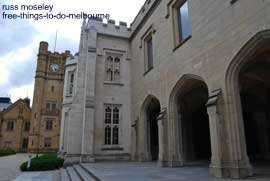 ......You can download a brochure, map and audio guide about this walk from my webpage - Melbourne University Walk. .......It has a map and fairly detailed information about each of the art exhibits. ........I'll have a look at these art exhibits when I return to see the Mad Max underground carpark which I also mention on my Melbourne University Walk webpage! Find where the museum is located on the map below.